We are buddies with Ms. Wong's High Tech Middle Advisory. 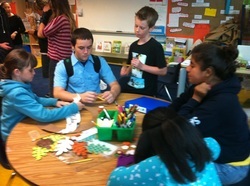 Every Tuesday they come over to us and we work together on challenges and games. In this picture, we are making a Thanksgiving wreath, with the different things that we are grateful for written on labels amongst the leaves.